This is what our clients say time and time again. How do you select the perfect place to open a new business, or to relocate your existing corporation? A high quality of life, low tax bracket, ease of staffing and all the amenities you are accustomed to are all important elements to consider. Starting a business overseas and moving to a new country can be daunting, so we’ve thought of everything you’ll need for a smooth transition. So far, we have assisted more than 250 companies with the site selection and corporate relocation and helped them relocate to Cayman from all over the world. Our experienced Client Services Team can introduce you to a wide range of tried-and-tested reliable service providers to help you every step of the way. If you are seriously considering corporate relocation, then CEC is a good option. From designing your offices, to supplying the furniture and fittings of your choice, and getting your telecoms, data, and IT solutions in place for your arrival, our team will be here. They can introduce you to real estate professionals to help you and your staff find that perfect home or car dealers to assist with vehicles. We can recommend computer and office machine providers, mobile phone and data services providers, and even recommend schools for your kids. Our network is the key and you won’t be making the big move alone – you will have our entire network of tried and tested, reliable professional service providers and our in-house team to support you through your corporate relocation. If you wish to hire staff from Cayman’s talented workforce, we have a free jobs portal and our staff work with local recruitment specialists who can also help find local or international talent to place in your Cayman office. We can set you up with shippers and movers, and even help you import your family pet! Whatever your needs, we’ve got them covered. We are your single point of contact for all your requirements. You are free to bring your staff or new recruits from anywhere in the world to work in your Cayman office and there are no restrictions on the number of people you can place here. There are no H1-b visa problems here and 5-year renewable work/residency visas can be processed here within 5 working days, subject to the due diligence and paperwork requirements. We work with over 100 professional services providers and are happy to make introductions so they can assist with everything you, your staff and company needs to make your move easy. In my last 25 years of living and working in 7 different countries, no international move was so well-organised and stress-free as my move to the Cayman Islands thanks to Cayman Enterprise City. This is a one stop solution to the business relocation at its finest. Well done! They say a company is as good as its people, well CEC is testament to that! Setting up was easy, trouble free and efficient. The head office of our global company is in Vancouver and we set up in CEC because it ticked all our boxes. We looked at several other jurisdictions for our international holdings but CEC made it easy and cost-effective and provided a licensing and immigration solution in a one stop shop. President of AirG Global Holdings SEZC and Legal Counsel. We made the very brave decision to move from California to Grand Cayman and the ‘Rolling out of the red carpet’ ease that Cayman Enterprise City offered in coordinating all of the paperwork needed was fantastic. We set up a presence with Cayman Enterprise City and it’s been great to be part of a larger zone, where we meet and network with other zone companies and likeminded entrepreneurs. Managing Partner, Valerian Capital SEZC. We have established and operated businesess is 4 countries in the last 20 years and the CEC helped make our move to Cayman our most successful venture yet - we couldn't have done it without you! I decided to move to the Cayman Islands a year ago for business opportunities made viable through Cayman Enterprise City. It was definitely the most enjoyable immigration experience that I have had in my last 15 years of emigrating, living and working in 4 different countries. Top Rock Enterprises SEZC Ltd. 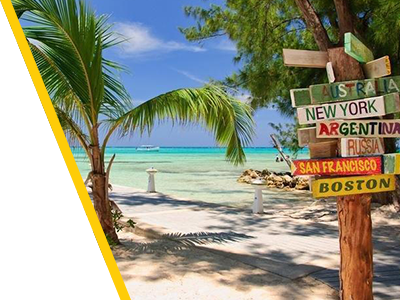 Setting up a business within Cayman Enterprise City is easy, fast and affordable. I would recommend the experience to any entrepreneur or business owner who wants to take advantage of Cayman’s tax neutral status and relocate to this beautiful island. CEO, Whose Around Me SEZC. I am very pleased we set up the business in CEC. They made it really easy to relocate here all the way from Australia with little knowledge of Cayman Islands. Cayman is a perfect International Business location, the time zone is great for collaborating with my clients in Brazil. CEC has cultivated a friendly, supportive business climate. The members of the CEC team guided our company through a seamless transition to the Cayman Islands which has allowed us to leverage the many advantages of the economic zone and to grow our business toward its full potential. Director, ATNV Management SEZC Inc.
Cayman Enterprise City has presented advantages for our company that would be hard to find elsewhere.